Posted March 6th, 2012 by David Porter & filed under Technology. Society changes in direct and rapid response to the evolution of technology in general and the internet in particular. We launch an occasional series of blog articles about health, education, employment, transport, entertainment, defence, sport, finance and policing, all areas under exponential change pressure through technology. Later this year the US military is set to take delivery of the very latest in robotics: a soldier capable of front line combat, as part of a £17m project. Not yet with the relentless single-minded extermination of the Hollywood fictional Terminator, it nonetheless can jump, squat,, walk and kneel. It can also walk a treadmill and do actual press-ups. 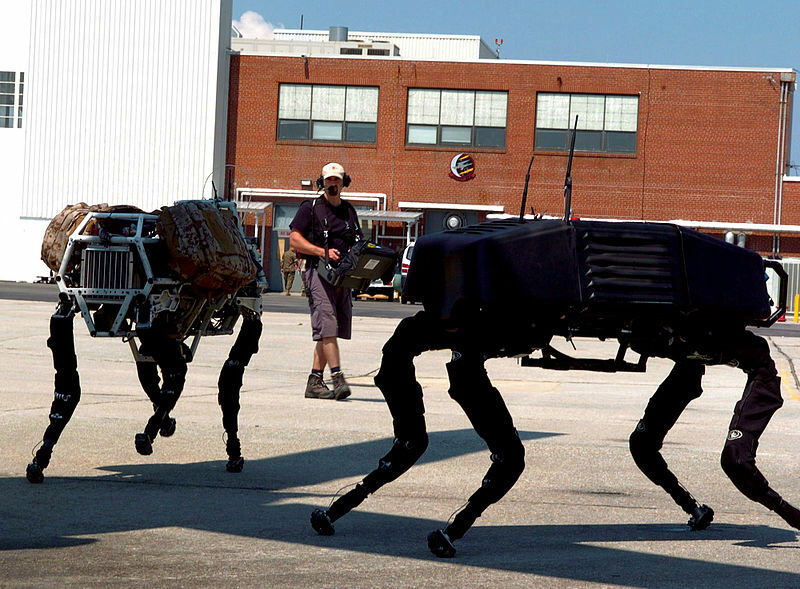 The manufacturer Boston Dynamics have released a video of Petman exercising (the head and hands are yet to be added). Company President Marc Raibert told Gillespie that they had turned a corner in robotics. ‘The brain is in a square box on the chest area driving 30 hydraulic actuators that are effectively Petman’s muscles’. The carbon fibre feet can walk it at about four and a half miles per hour. 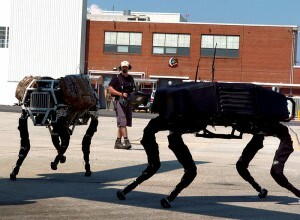 Gillespie warned that the day when ‘robot regiments take over from humans on the battlefields’ is not yet on the horizon. For now it is testing chemical combat warfare suits for soldiers. He also reported on two further technology developments. One, is a driverless ground support surrogate vehicle which will carry as much equipment as twelve men can. It is a 6-wheeled flat-bed buggy that can be programmed to follow troops or driven manually. The second further development is AlphaDog (which supersedes the earlier BigDog), a rough terrain pack mule for infantrymen. The UK’s BAE Systems has created what Gillespie calls an ‘invisible tank’, a skin of hexagonals which adjust temperature to the surroundings in order to be invisible to infrared and thermal imaging sweeps. The world has long since got used to remote drones (such as those killing insurgents and terrorists in Afghanistan and elsewhere), and remote surveillance and ‘star wars’ type industrial scale conflict, as sci-fi becomes reality. But Where is it Going? Integrating attack and defence, smarter equipment like self-guided bullets, intelligence gathering on a near-perfect level, futurism studied to a new science and hyper-advanced aerial weapons together with biological programming as yet undreamed of – all that is the future of defence and attack. One informed viewpoint came a year ago from David Larter writing in the USA’s Army Times about TRADOC (Training and Doctrine Command) who released a future vision of warfare, described by some as like a script from Star Trek. Obviously future forces will need better protection of improvised explosive devices, mobile yet well protected troop carriers. To do this, they will explore nanotechnology which ‘can change the structure of matter on a molecular and atomic level’. If they can pull that off, it will dovetail with soldiers ‘better prepared for the stress of multiple deployments’. The holy grail of motivating troops to go again and again has been sought ever since man has fought against man. We’re on the threshold of combining the wonders of digital technology with understanding of both human physiology and psychology. They will produce better, stronger, leaner fighters. Human, robotic or both combined. The jury is out on how far all that will be harnessed to other beneficial purposes, or are the threats to mankind so great that only this level of technology is enough to defend us? The Sunday Times, He climbs, he yomps, he sweats: first robot soldier. James Gillespie, 22 January 2012. Army Times, David Larter, January 2011.